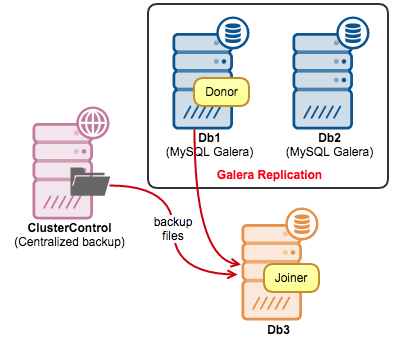 State Snapshot Transfer (SST) is a way for Galera to transfer a full data copy from an existing node (donor) to a new node (joiner). If you come from a MySQL replication background, it is similar to taking a backup of a master and restoring on a slave. In Galera Cluster, the process is automated and is triggered depending on the joiner state. In this blog post, we’ll show you how to avoid SST. xtrabackup is non-blocking for the donor. Use xtrabackup-v2 (and not xtrabackup) if you are running on MySQL version 5.5.54 and later. To avoid SST, we’ll make use of IST and gcache. IST is a method to prepare a joiner by sending only the missing writesets available in the donor’s gcache. gcache is a file where a Galera node keeps a copy of writesets. IST is faster than SST, it is non-blocking and has no significant performance impact on the donor. It should be the preferred option whenever possible. 150707 17:15:53 [Note] WSREP: Signalling provider to continue. Galera uses a pre-allocated gcache file of a specific size to store writesets in circular buffer style. By default, its size is 128MB. We have covered this in details here. It is important to determine the right size of the gcache size, as it can influence the data synchronization performance among Galera nodes. We can tell that the Galera node can have approximately 16 minutes of downtime, without requiring SST to join (unless Galera cannot determine the joiner state). If this is too short time and you have enough disk space on your nodes, you can change the wsrep_provider_options=”gcache.size=<value>” to an appropriate value. In this example, setting gcache.size=1G allows us to have 2 hours of node downtime with high probability of IST when the node rejoins. This grastate.dat file has no seqno or group ID. This node crashed during DDL. grastate.dat is unreadable, due to lack of permissions or corrupted file system. To avoid SST, we would get a full backup from one of the available nodes, restore the backup on the new node and create a Galera state file so Galera can determine the node’s state and skip SST. In the following example, we have two Galera nodes with a garbd. We are going to convert the garbd node to a MySQL Galera node (Db3). We have a full daily backup created using xtrabackup. We’ll create an incremental backup to get as close to the latest data before IST. Before creating an incremental backup on Db1 to get the latest data since the last full backup, we need to copy back the xtrabackup_checkpoints file that we got from the extracted full backup on Db3. The incremental backup, when applied, will bring us closer to the current database state. Since we got 2 hours of buffer after increasing the gcache size, we should have enough time to restore the backup and create the necessary files to skip SST. [root@db1]$ innobackupex --user=root --password=password --incremental --galera-info --incremental-basedir=/root/temp --stream=xbstream ./ 2>/dev/null | ssh root@db3 "xbstream -x -C /restore/incremental"
[root@db1]$ innobackupex --user=root --password=password --galera-info --stream=tar ./ | pigz | ssh root@db3 "tar xizvf - -C /restore/full"
150710 14:08:20  innobackupex: completed OK! 150710 14:49:58 [Note] WSREP: Signalling provider to continue.